Maestro Wedger - Unique carousel cutting system perfect for wedging and coring apples, pepper coring and slicing, wedging tomatoes, citrus or onions. 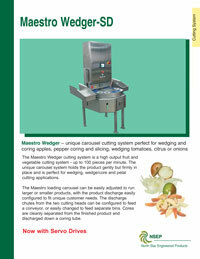 The Maestro Wedger cutting system is a high output fruit and vegetable cutting system - up to 100 pieces per minute. The unique carousel system holds the product gently but firmly in place and is perfect for wedging, wedge/core and petal cutting applications. 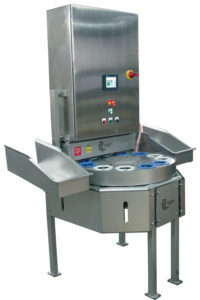 The Maestro loading carousel can be easily adjusted to run larger or smaller products, with the product discharge easily configured to fit unique customer needs. 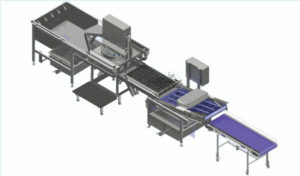 The discharge chutes from the two cutting heads can be configured to feed a conveyor, or easily changed to feed separate bins. Cores are cleanly separated from the finished product and discharged down a coring tube. 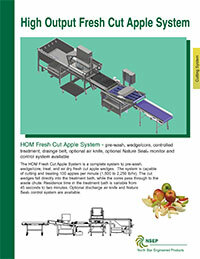 The HOM Fresh Cut Apple System is a complete system to pre-wash, wedge/core, treat and air dry fresh cut apple wedges. The system is capable of cutting and treating 100 apples per minute (1,500 to 2,250 lb/hr). The cut wedges fall directly into the treatment bath, while the cores pass through to the waste chute. Residence time in the treatment bath is variable from 45 seconds to two minutes. Optional discharge air knife and Nature Seal control system are available.